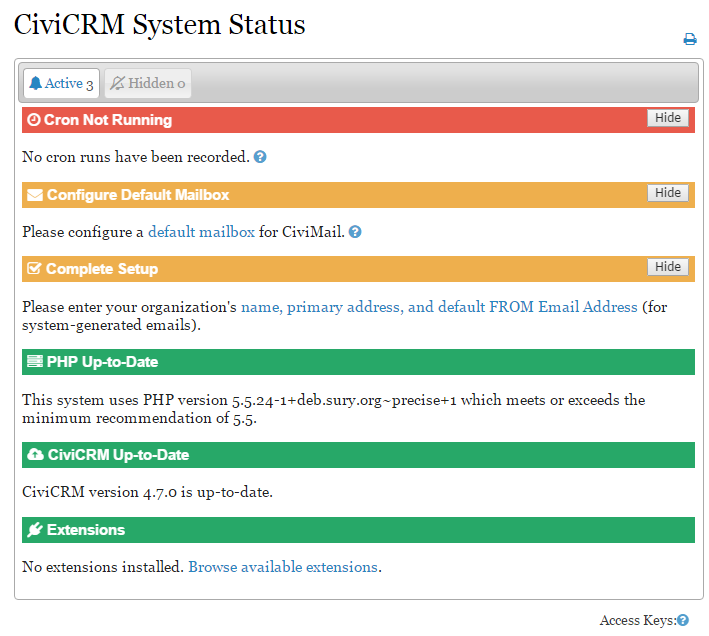 Starting in 4.7, the CiviCRM System Status screen shows you a view of the current status of your CiviCRM installation. It is found at Administer > Administration Console > System Status. Items in Red need to be addressed as soon as possible. An item in red generally indicates something broken that will stop CiviCRM from working normally. Items in Orange should be addressed as soon as you can and may stop you from completing key CiviCRM tasks. Items in Green are set up correctly and are on the screen for information only. If you have an issue that needs to be addressed, click the link provided or the question mark icon for additional support. After installing a new instance of CiviCRM, site administrators should review the following list of configuration tasks - and implement any that are related to the features and components that will be used by their organization. You must be logged in as a user with administer CiviCRM permission to complete these tasks. All configuration settings are accessed from the Administer CiviCRM page. Configure » Global Settings » Localization » - Language, currency, list of the countries. Configure » Domain Information - Organization name, email address for system-generated emails, organization address. Configure » Global Settings » Site Preferences - Configure screen and form elements for Viewing Contacts, Editing Contacts, Advanced Search, Contact Dashboard and WYSIWYG Editor. Configure » Global Settings » Address Settings - Format addresses in mailing labels, input forms and screen display.